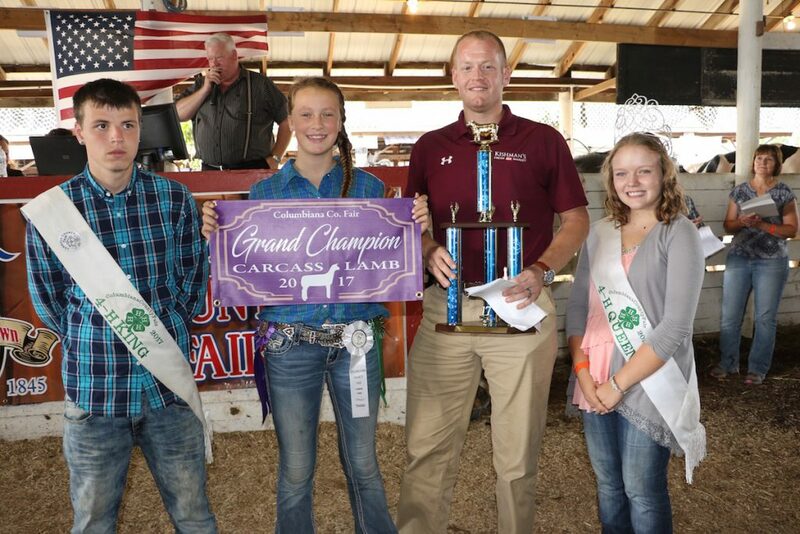 Two competitors — Paris & Washington Insurance Company and Sandy and Beaver Insurance, represented by Becky Holmes and Hunter Palmer — paid $5,000 for Autumn Whiteleather’s grand champion cheese basket. Also pictured are Phil Mueller (left) and Venae Watts, representing Minerva Dairy, which calculates the winners and donates all the cheese. 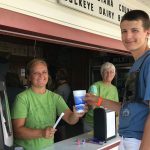 The 2017 Columbiana County Fair junior fair market, cheese and dairy goat fudge sales were held Aug. 3 and 5. 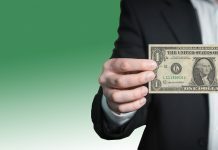 Here’s a list of the champions and their sale prices. 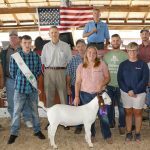 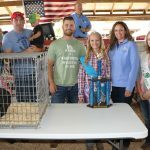 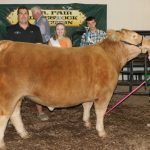 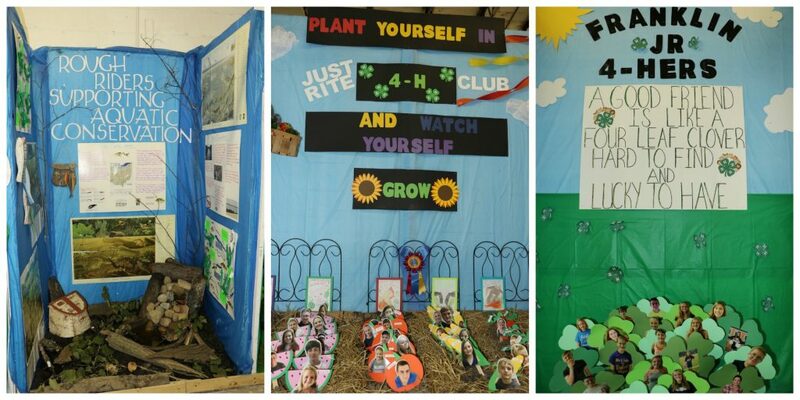 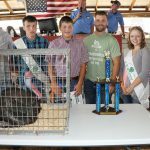 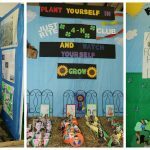 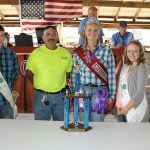 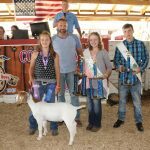 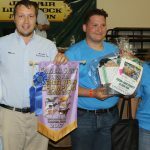 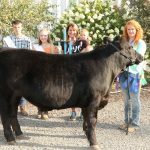 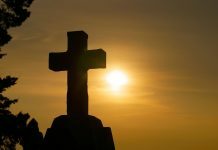 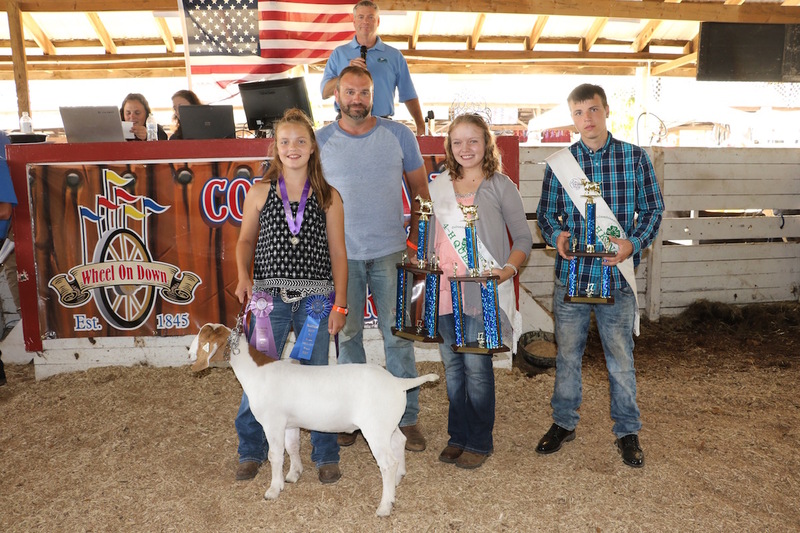 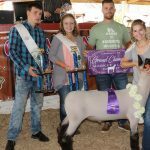 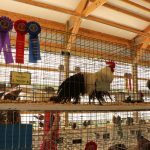 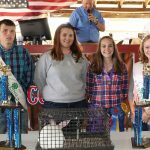 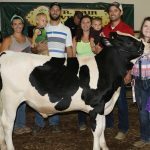 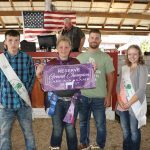 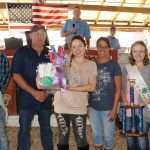 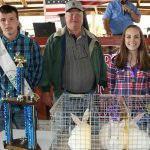 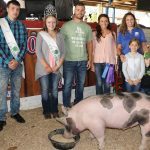 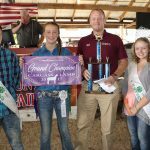 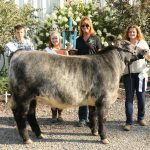 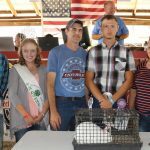 You can also scroll to the bottom of this listing to see a slide show of the winners’ photos, as well as other candid photos from the fair; or click on individual youth names to see a larger photo. Junior showmanship: Dale Cusick Jr. 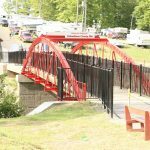 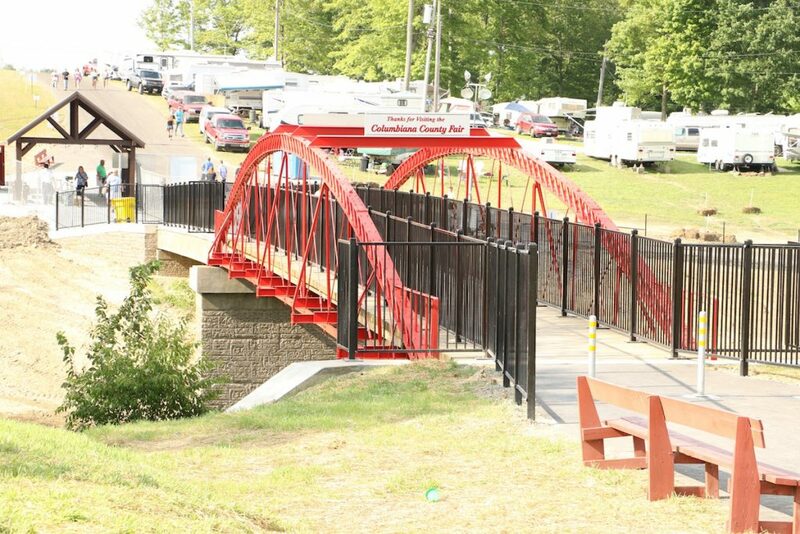 The new installation of a second historic bridge at the Columbiana County Fair is now the new entrance from the main parking lot. 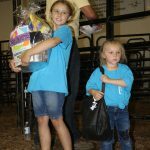 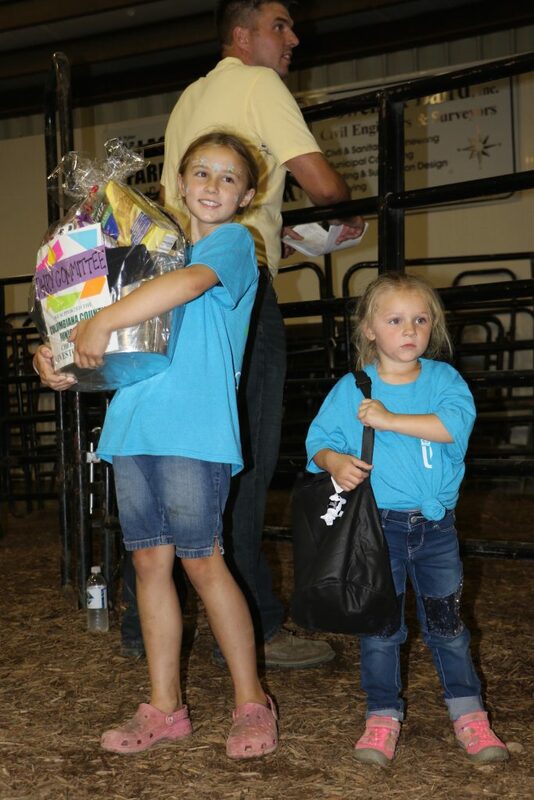 Maddie Neville (left) and Kenzie Coblentz encouraged bidders to buy a cheese basket to support the county 4-H dairy committee at the Columbiana County Fair. 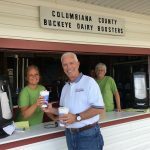 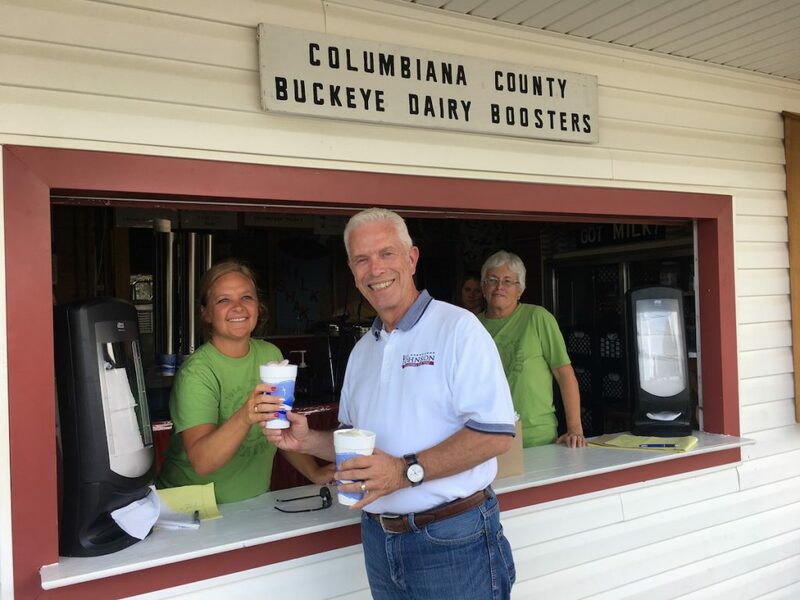 U.S. Rep. Bill Johnson stopped by the Columbiana County Dairy Boosters' milkshake stand at the fair. Also pictured are Farm and Dairy advertising representatives Denise Rhodes (left) and Anne Benner Brown. 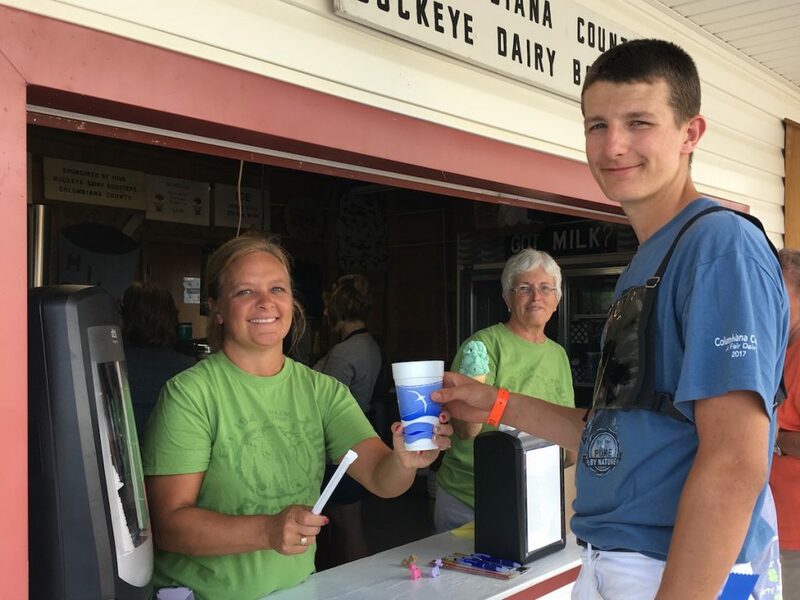 Drew Malloy, who just finished showing dairy cattle with Kiko Dairy Farm, headed straight to the Dairy Boosters' stand for a milkshake! 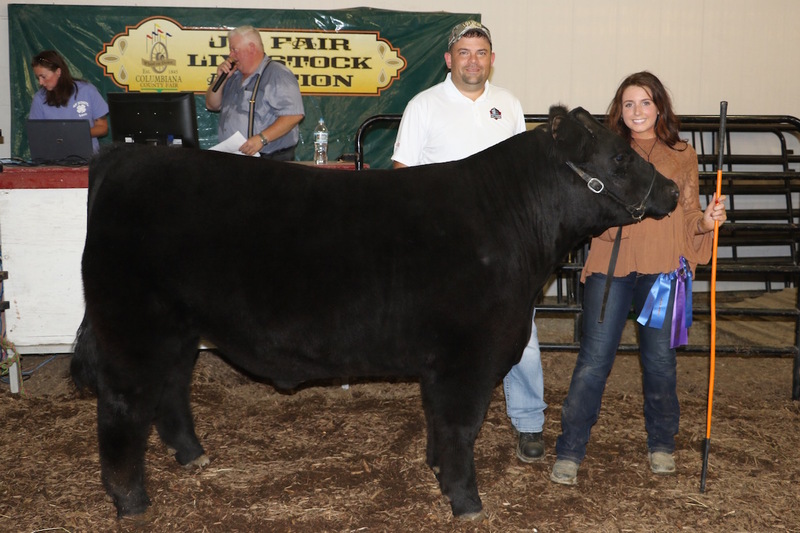 Cope Farm Equipment, represented by Stephanie Cope, paid $2.55 a pound for the reserve outstanding steer project, a 1,217-pound steer raised by Macee Mercure. 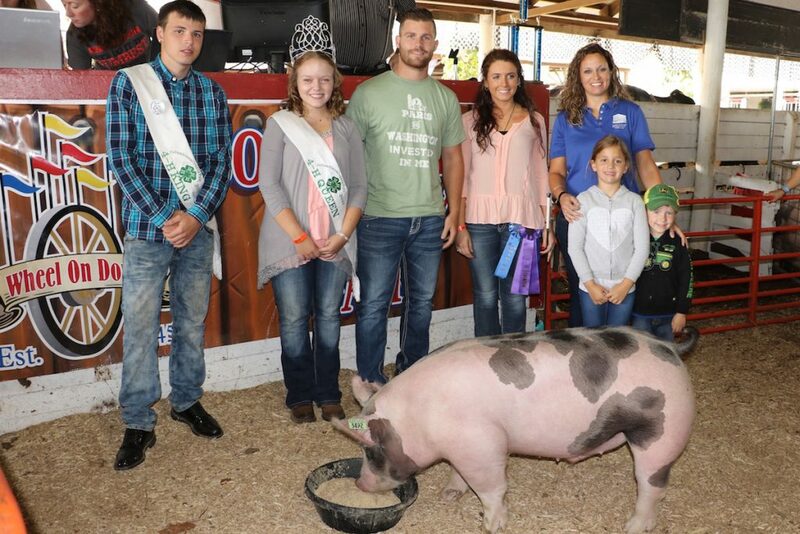 Also pictured are fair royalty Quinton Ayers and Hannah Hephner. Megan Drake earned the grand outstanding steer project honor, and was steer showman of showmen and senior skillathon winner. 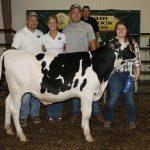 Her 1,227-pound steer, born and raised in Columbiana County, sold for $5.25 a pound to Mac Trailer, represented by Jenny Conny, holding Lane Raber. 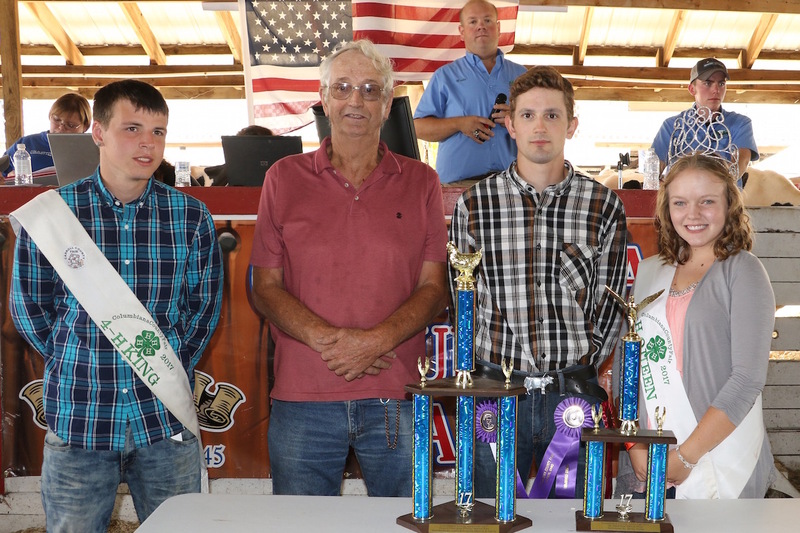 Also pictured are fair royalty Quinton Ayers and Hannah Hephner. 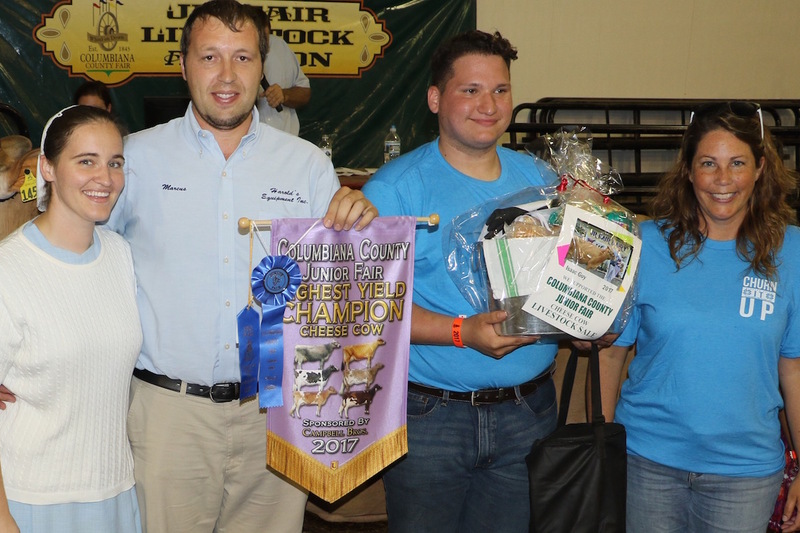 Sarchione Chevy, represented by Joe, Amanda and John Sarchione, paid $6 a pound for Lauren Hippely’s 600-pound reserve champion dairy beef feeder. 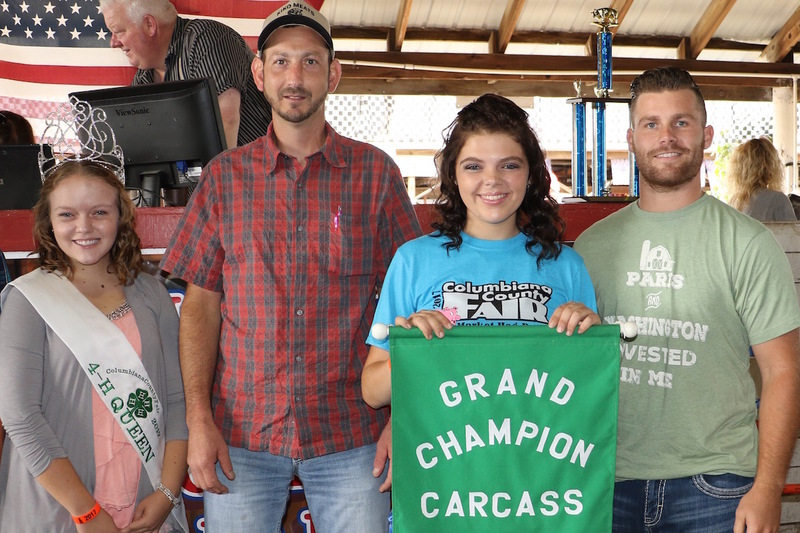 Sydnie Holden’s 1,355-pound grand champion carcass steer sold for $4.50 a pound to Paris & Washington Insurance Company, represented by Hunter Palmer. Also pictured is 4-H Queen Hannah Hephner. 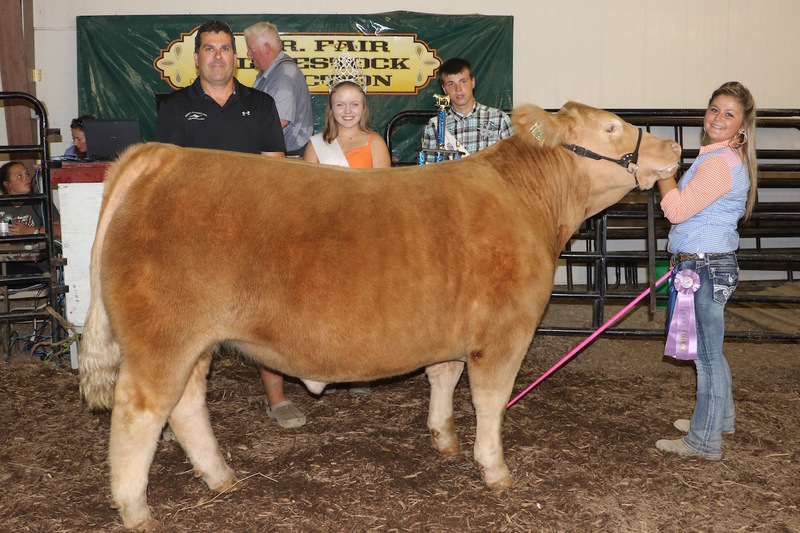 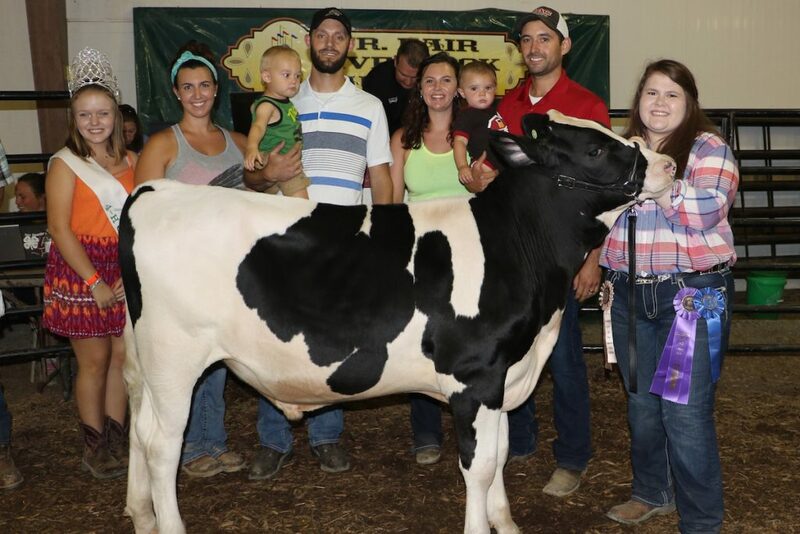 Olivia Hippely’s 571-pound grand champion dairy beef feeder calf sold for $7 a pound to Mac Trailer, represented by Julia, Braxton and Tate Ray, and Rachel, Lane and Chad Raber. 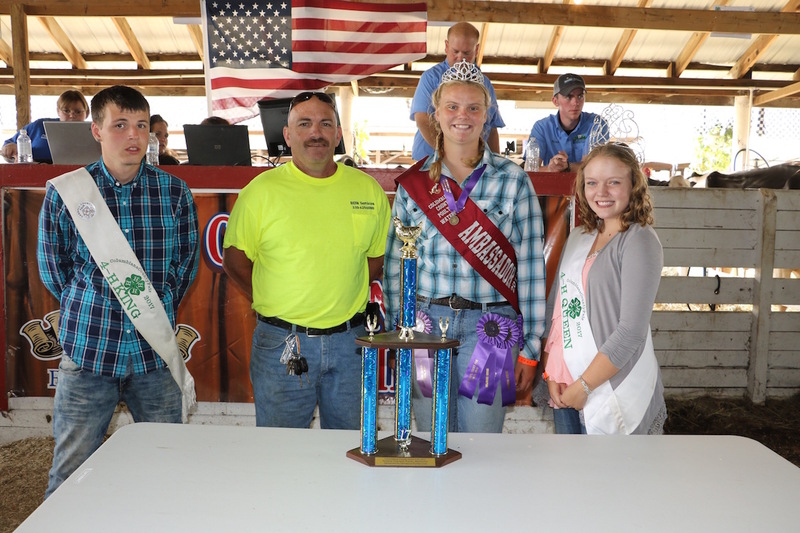 Also pictured is 4-H Queen Hannah Hephner. Daniel McCracken’s reserve champion carcass steer, weighing 1,245 pounds, sold for $4 a pound to Sarchione Chevrolet and The Sarchione Auto Group, represented by Johnny Johnston (left) and Joe Sarchione. K&S Millwrights, represented by owner Gary Irwin, paid $4,250 for Bailey Campbell’s reserve champion cheese basket. 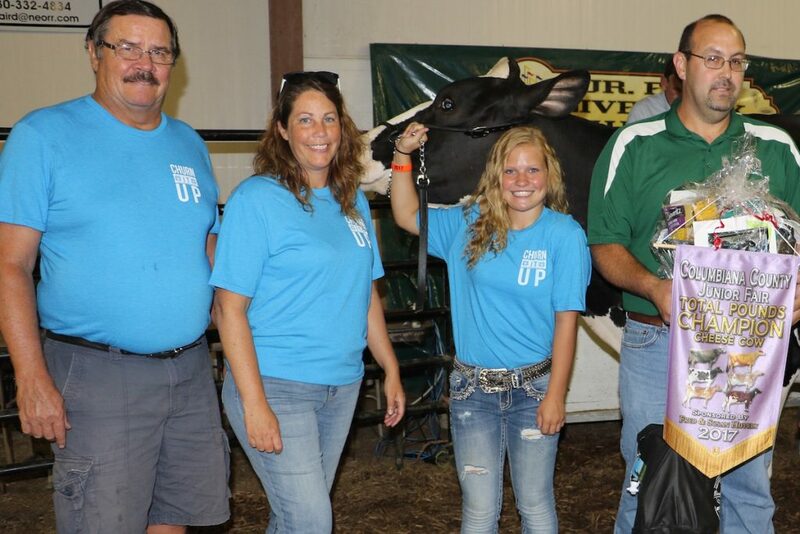 Also pictured are Phil Mueller (left) and Venae Watts, representing Minerva Dairy. Madison Pidgeon’s 1,330-pound reserve champion steer sold for $7.25 a pound to Graft Electric, represented by Larry Burns. 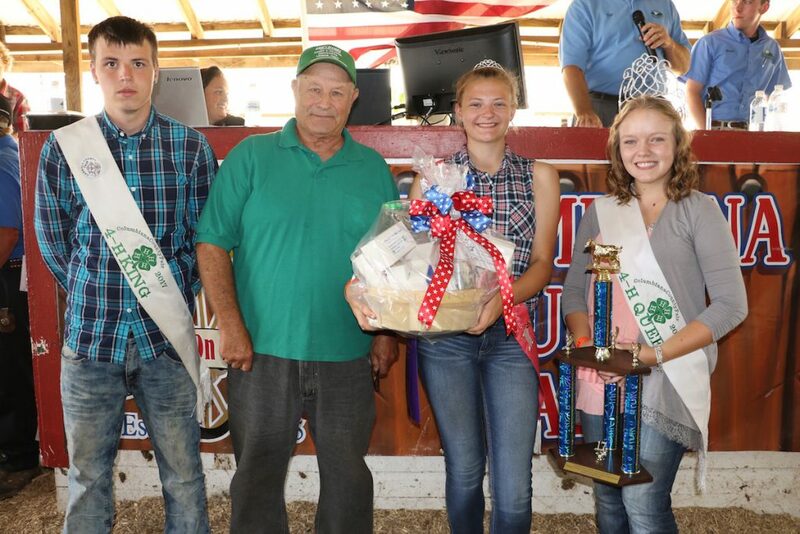 Harold’s Equipment, represented by Leah and Marcus Miller, paid $1,050 for Isaac Guy’s yield champion cheese basket. 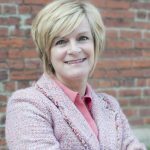 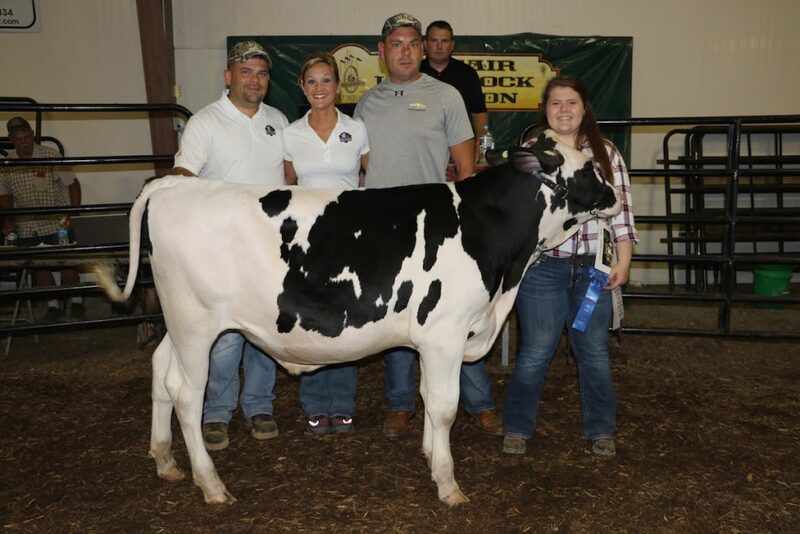 Also pictured is Venae Watts of Minerva Dairy. 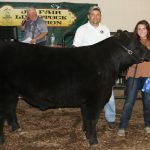 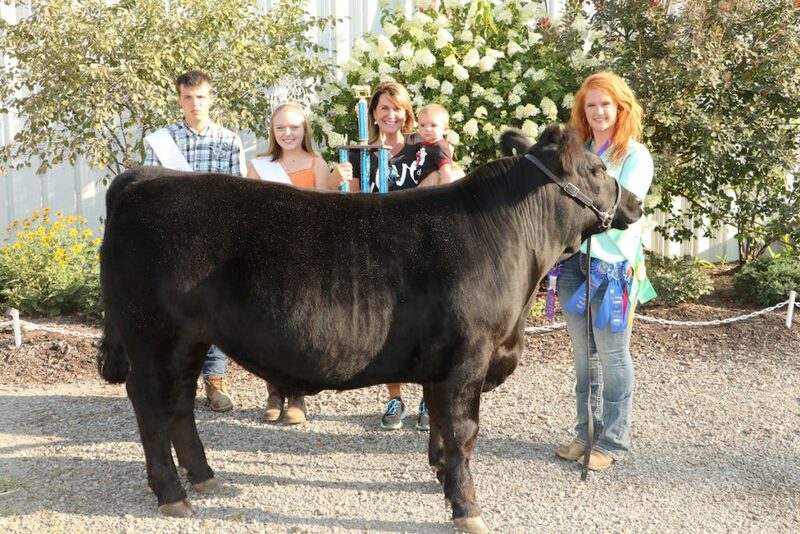 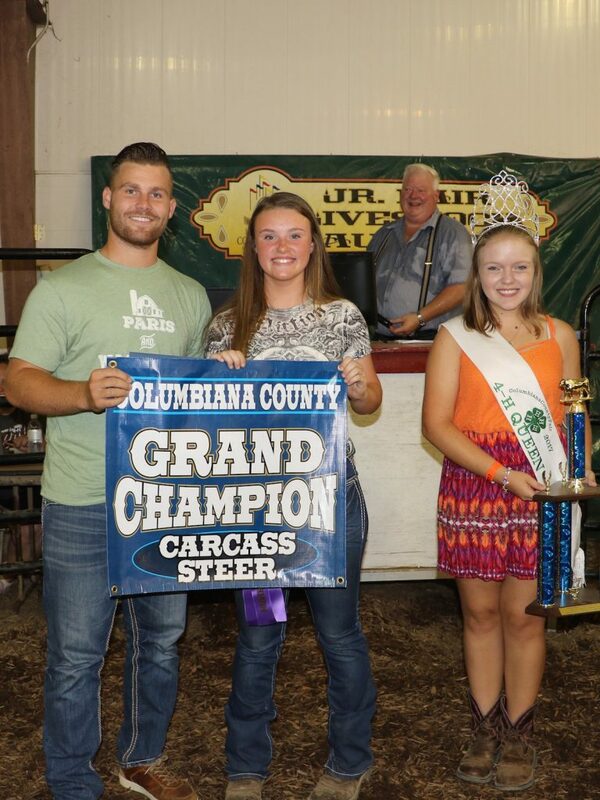 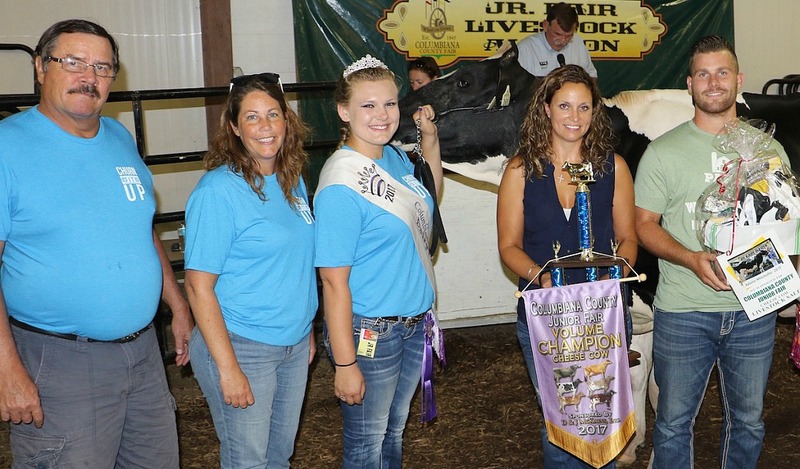 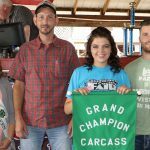 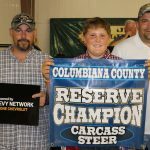 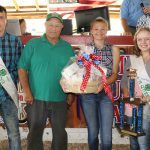 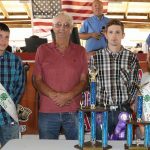 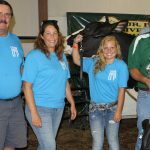 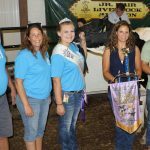 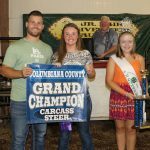 Sarchione Chevrolet and The Sarchione Auto Group, represented by Joe Sarchione, paid $7.25 a pound for Kira Sharp’s grand champion steer at this year’s Columbiana County Fair. 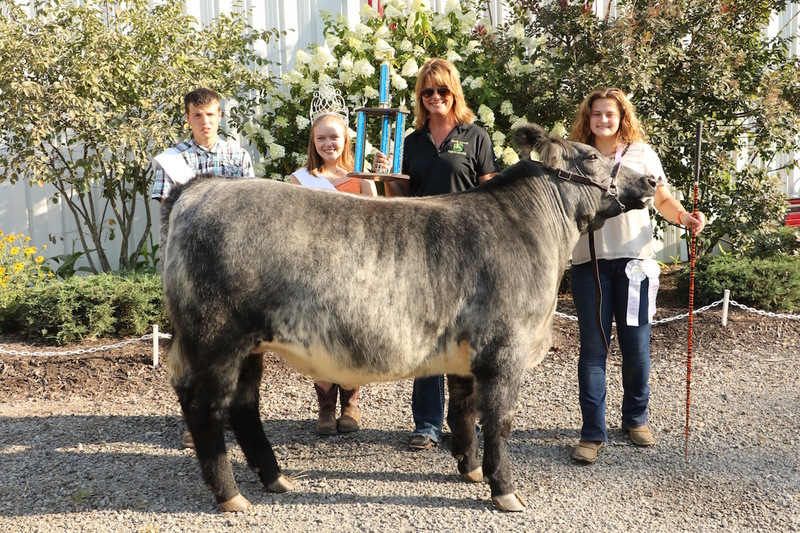 The champion weighed 1,315 pounds. Paris & Washington Insurance, represented by Hunter Palmer, and Sandy and Beaver Insurance, represented by Becky Holmes, paid $700 for Kiersten Cusick’s reserve champion turkey. 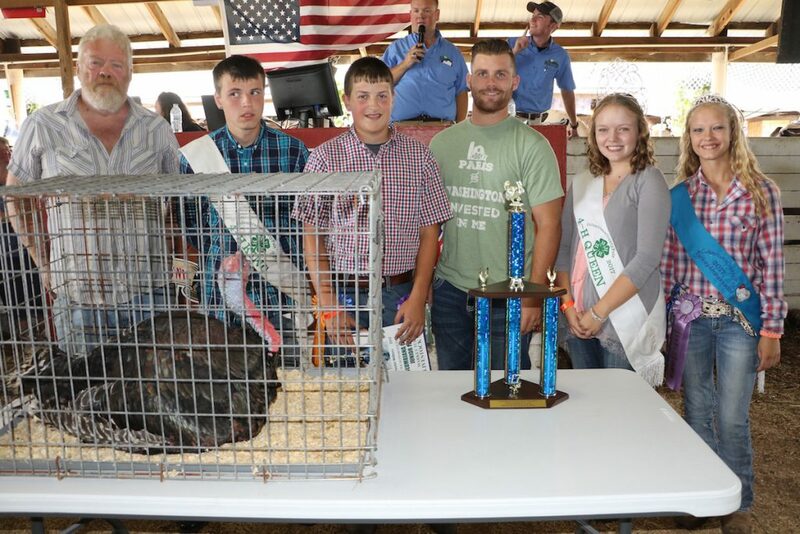 Paris & Washington Insurance, represented by Hunter Palmer, paid $700 for Austin Withers’ grand champion turkey. 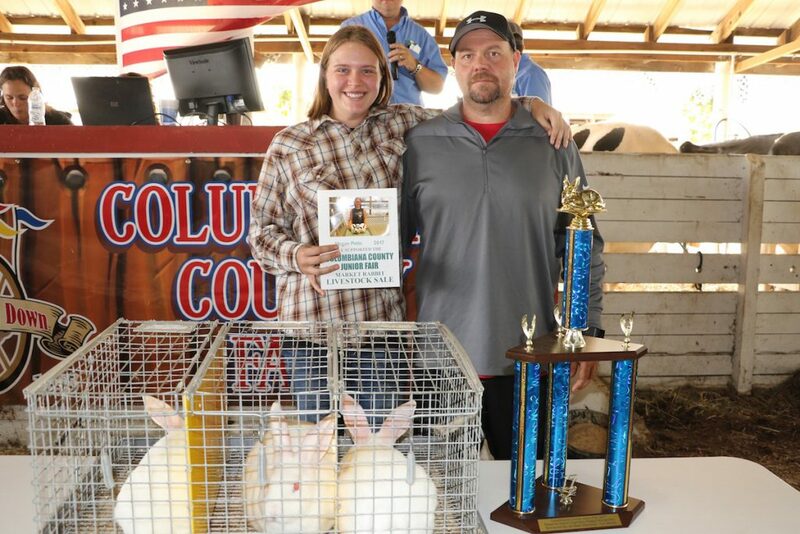 Allison Slutz sold her reserve champion pen of market chickens for $1,200 to Row Services LLC, represented by Dan Rohr. 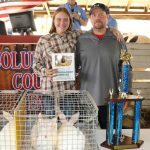 Michael Turvey of Turvey Masonry & Construction paid $450 for Megan Potts’ reserve champion pen of three rabbits. 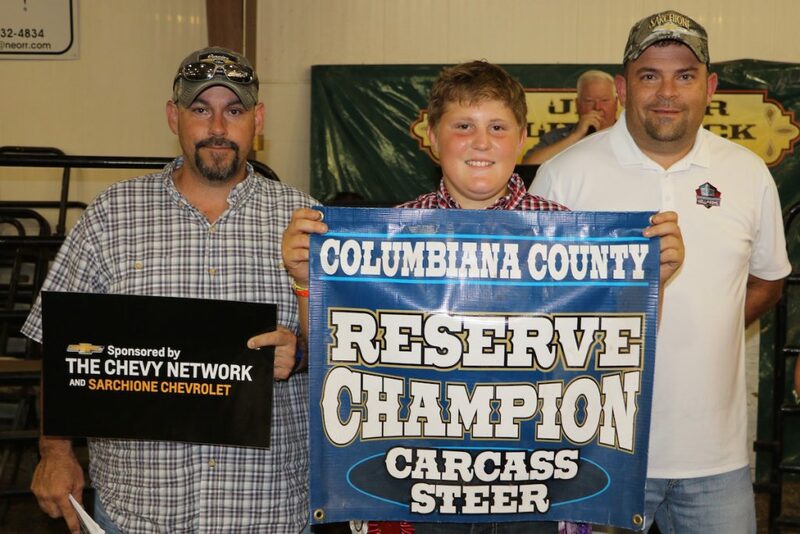 Steer Financial Advisors and Paris & Washington Insurance, represented by Hunter Palmer, paid $8.50 a pound for Dakota McCracken’s 123-pound reserve champion carcass lamb. 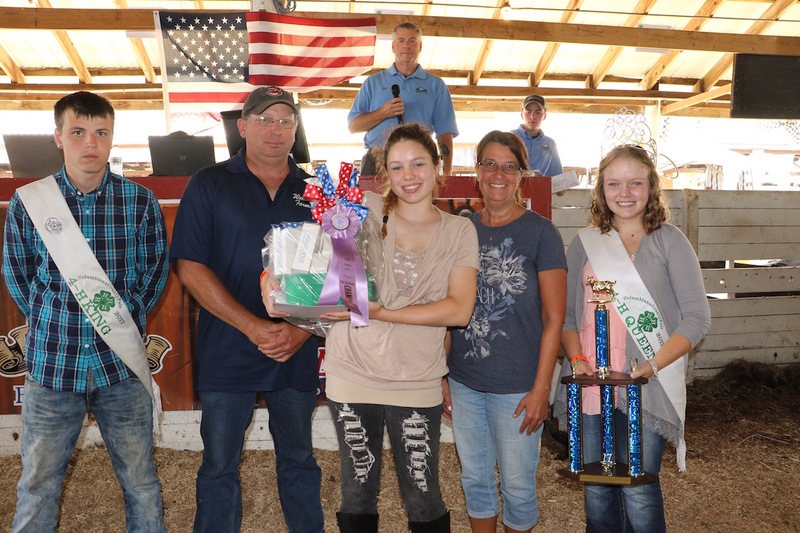 Amanda French sold her grand champion goat fudge to Center Township Trustee Ken Schreffler for $400. 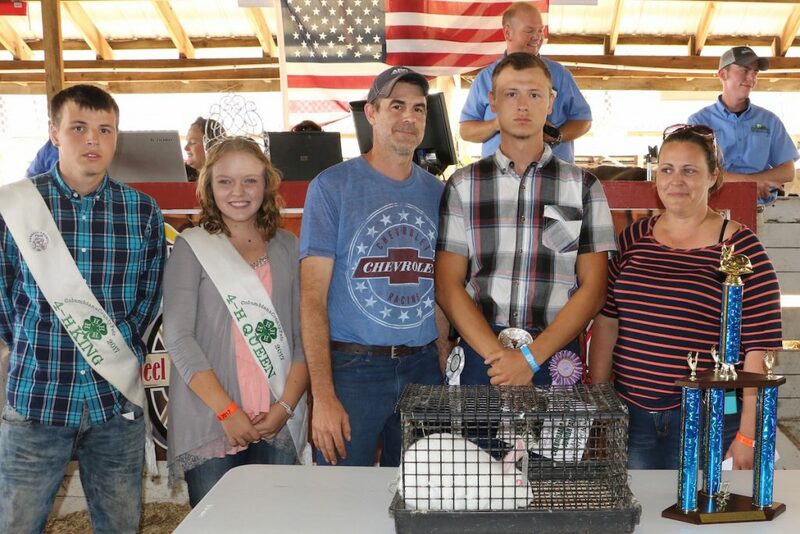 Darby Miller’s reserve champion goat fudge basket sold for $450 to Wallace Farms Feed and Drive Thru, represented by Paul and Jennifer Wallace. Emmy Jones’ 65-pound reserve champion goat sold for $4 a pound to D&G Mechanical, represented by Patrick Souders. 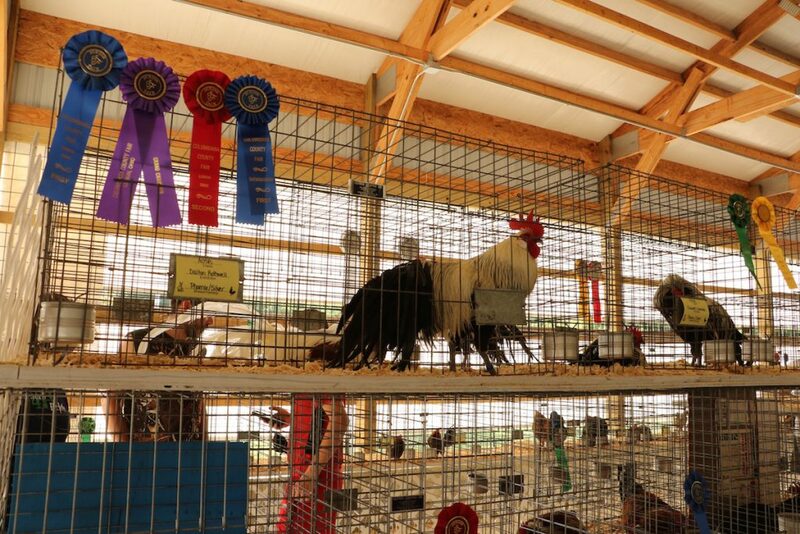 Jones was also the outstanding project winner, and bantam showman and bantam skillathon winner. 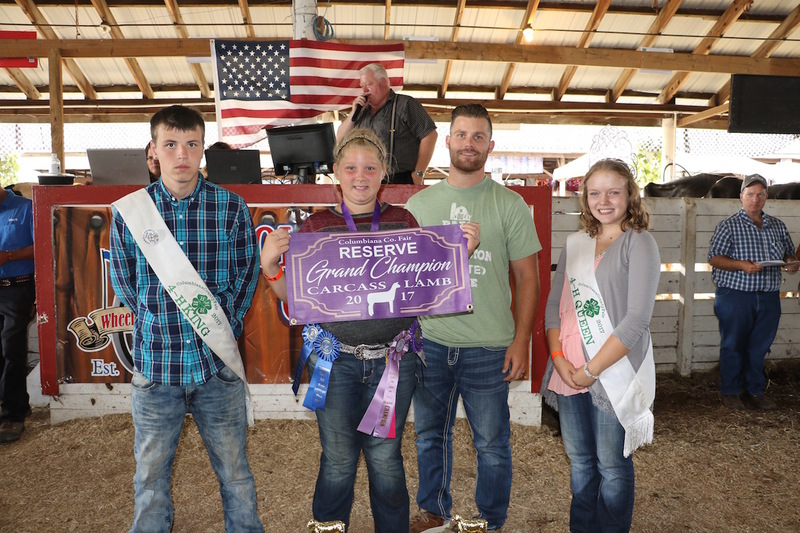 Shelby Peters raised this year’s reserve champion hog and was also the senior showman and showman of showmen. 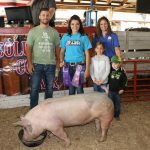 Her 280-pound hog sold for $8 a pound to Paris & Washington Insurance, represented by Hunter Palmer, and Sandy and Beaver Insurance, represented by Becky Holmes and her children, Kylie and Maxwell. 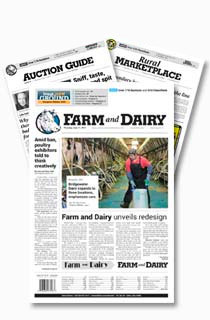 Taylor Cope’s 117-pound grand champion carcass lamb sold for $6 a pound to Kishman’s IGA, represented by Matt Kishman. Kira Sharp’s 263-pound grand champion market hog sold for $10 a pound to Paris & Washington Insurance, represented by Hunter Palmer, and Sandy and Beaver Insurance, represented by Becky Holmes and her children, Kylie and Maxwell. 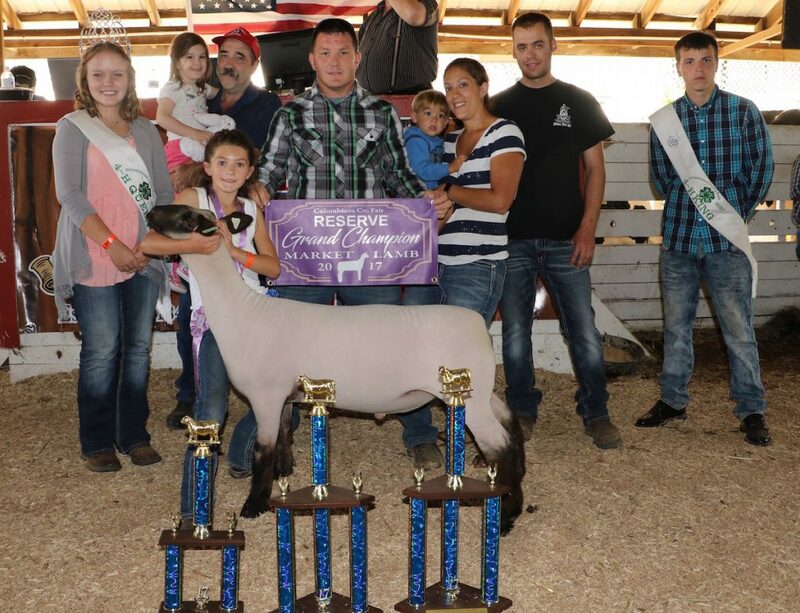 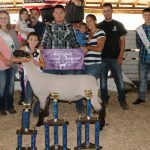 Bridget Hilliard raised the reserve champion market lamb, weighing 144 pounds. 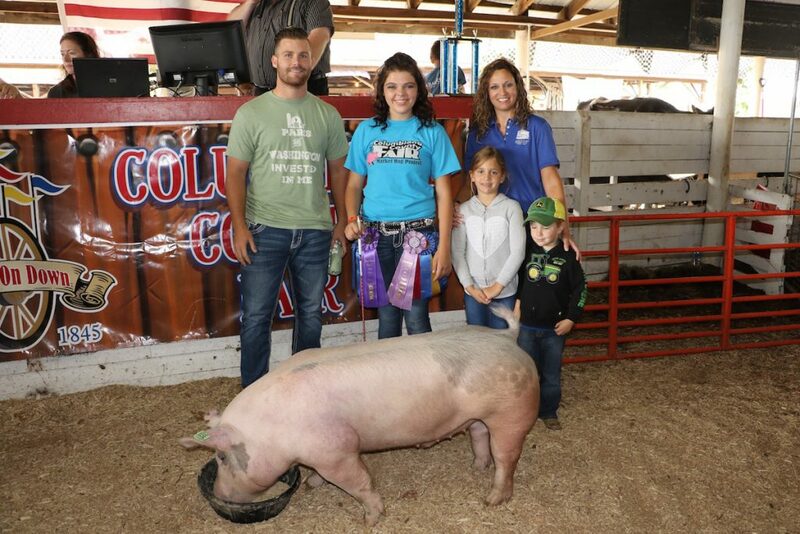 It sold for $12 a pound to SG Diesel Performance, represented by Scott, Amy and Landon Gram; Ramsey Hoof Trimming, represented by Joe and Ellie Ramsey; John and Angie French, and Hilliard Family Farm, represented by Anthony Hilliard. 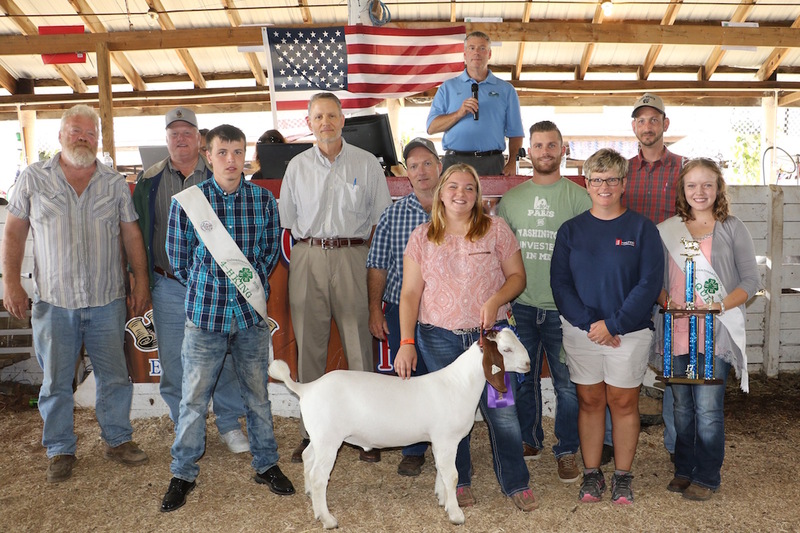 The 106-pound grand champion market goat, raised by Ashley Hahn sold for $20 a pound to a group of buyers: Hanoverton Feed, Paris & Washington Insurance, Kiko Meats, Sarchione Chevrolet, Haltech, JL Connecting Horseshoeing, Rogers Mill, Sugardale Meats, Jim and Patti Powell, and Jeff and Brooke Hahn. 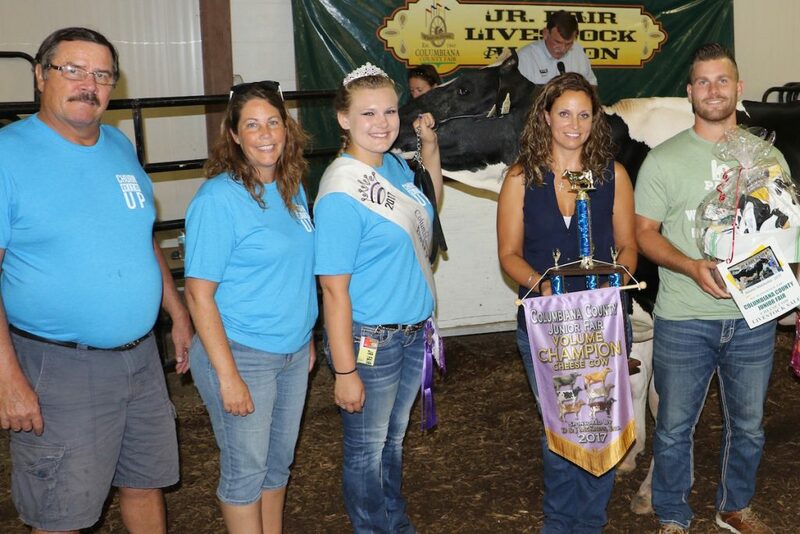 Also pictured is trophy donor Judge Scott Washam. 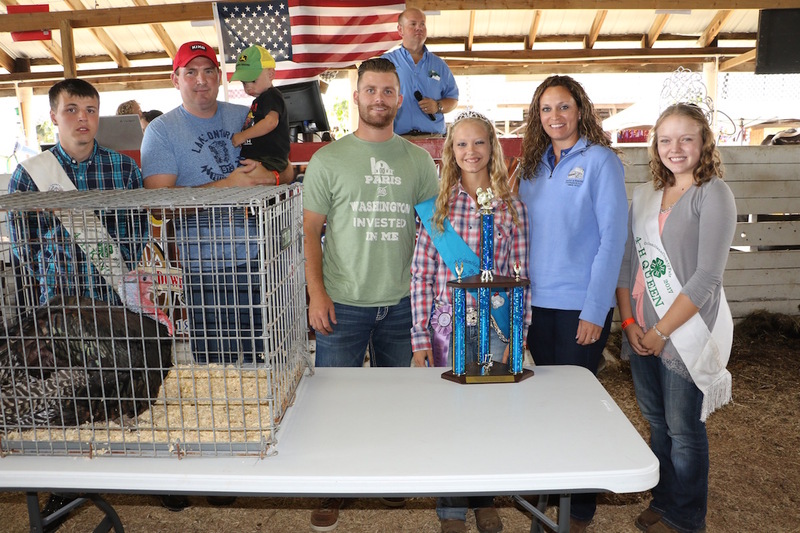 Dale Burbick paid $2,250 for Dylan Rothwell’s grand champion pen of chickens. 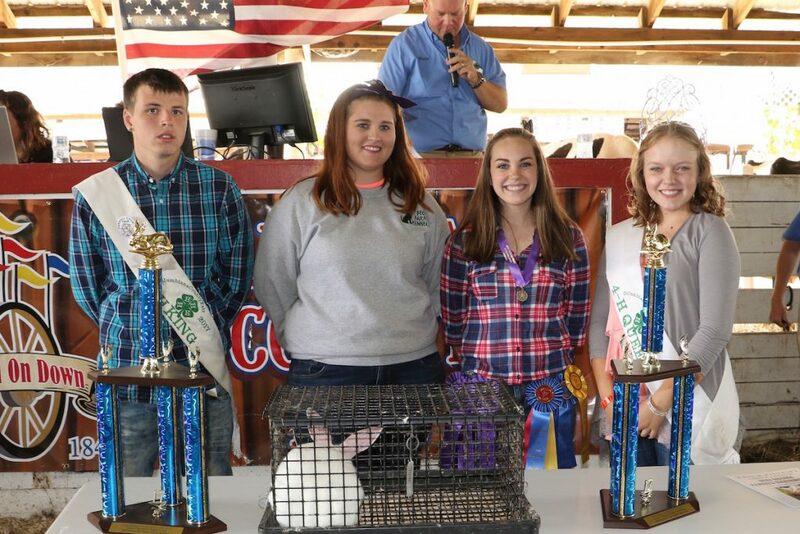 Bekka Hall’s single grand champion fryer rabbit sold for $175 to Feo Farm Kennels, represented by Autumn Feo. Cody Wright’s reserve champion fryer rabbit sold for $110 to M&M Home Maintenance, represented by Matthew White and Milissa Shaffer. 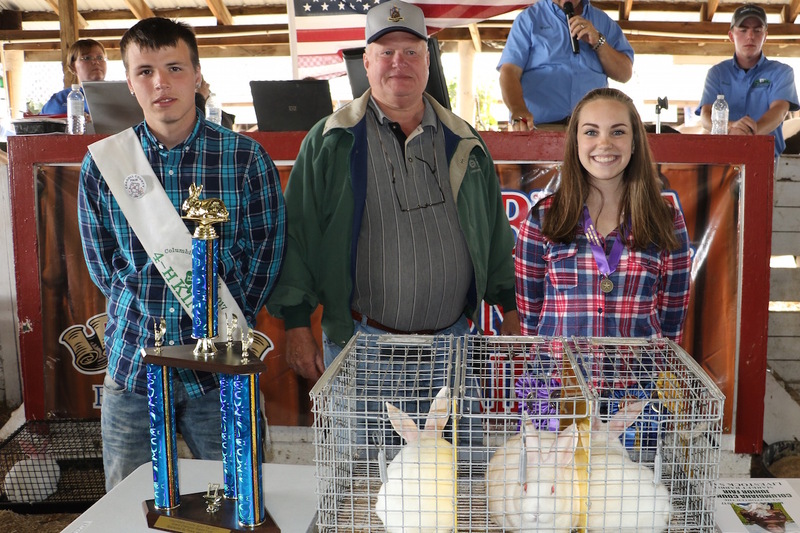 Bekka Hall’s grand champion pen of three rabbits sold for $450 to Jim (pictured) and Patti Powell. 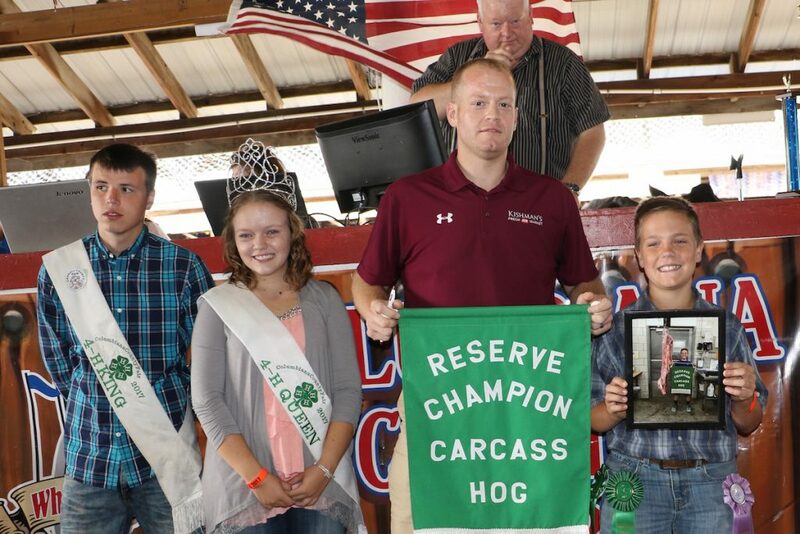 Kiko Meats, represented by Steve Kiko (left), and Paris & Washington Insurance, represented by Hunter Palmer, paid $5 a pound for Shelby Peters’ 236-pound grand champion carcass hog. 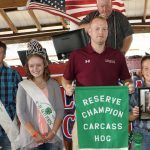 Kishman’s IGA, represented by Matt Kishman, paid $6.50 a pound for Maddox French’s reserve champion carcass hog weighing 220 pounds. 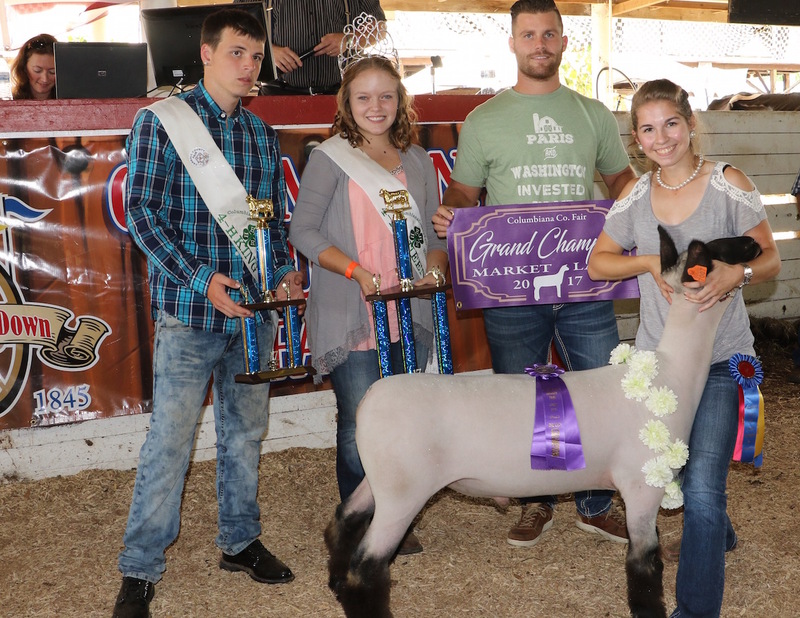 Margaret McNicol’s 147-pound grand champion market lamb sold for $12.75 a pound to Paris & Washington Insurance, represented by Hunter Palmer.